Anyone who has a sibling likely knows a thing or two about the intensity of competing. While often starting as “fun and games”, competitions can escalate in a hurry, especially between brothers. Sometimes this desire to become better than the sibling dissipates over time, but sometimes it just stays there, burrowing inside until waiting for the right moment to strike out. 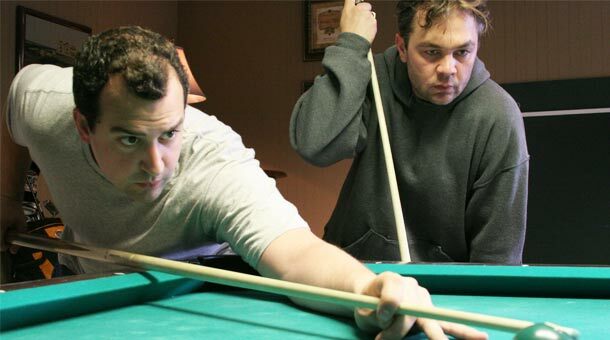 In The Do-Deca-Pentathlon, the latest film from the Duplass brothers (Jeff Who Lives at Home, Cyrus), we are presented with a textbook example of this primal urge. 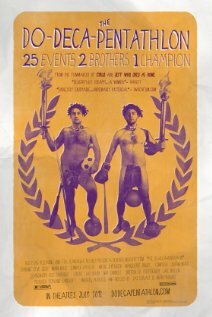 Jeremy (Mark Kelly) and Mark (Steve Zissis) are two estranged, thirtysomething brothers who have rekindled an amateur marathon tournament they created as teenagers, the Do-Deca-Pentathlon. This competition consists of 25 events — everything from basketball to table tennis to Laser Tag — and the winner will be dubbed the greatest of all time. While teenagers, their first attempt at this epic battle ended in controversy, as the “holding your breath underwater” event concluded when their grandfather thought one of them was drowning and pulled him out. This lack of conclusion has vested within them for 20 years, and now, at a family gathering they are ready to decide the winner once and for all. Of course, now the guys are out of shape and quite frankly are in no condition to partake in a grueling tournament such as this. That doesn’t stop them, however, and they stealthily find ways to leave the rest of the family so they can compete. Mark’s wife, Stephanie (Jennifer Lafleur), knows what they are doing and tries to put a stop to it. After all, Mark has been advised by his therapist to avoid any stressful activities for fear of a heart attack, and this is about the absolute worst thing he could be doing. This leads to the brothers meeting up in the middle of the night — while everyone is sleeping — in order to continue their marathon. To say they are dedicated is an understatement. There is a certain amount of drama herein thanks to the estranged relationship of the brothers, as well as the conflict between Mark and Stephanie, but there are enough laughs throughout to make this a lighthearted venture. The tournament is whimsical in nature, and it lends itself to some truly amusing moments such as when the family heads out to play Laser Tag. The brothers decide to team up and take out the rest of the family, leaving them to battle one on one for event purposes. In doing so, they go so far as to use military hand signals (which I get the feeling they learned from Call of Duty). If you are familiar with the work of the Duplass brothers, all of their trademark “mumblecore” techniques are at the forefront. This means that the obnoxious — and random — zoom-ins are heavily prevalent, and they quickly grow tedious. This is an extremely low budget film, and it was actually shot in 2008 before they had to move on to making Cyrus. Later commitments pushed this back to 2012, when they were finally able to put it all together. This film is also rather short, at just 76 minutes, but it feels like the perfect length. I must admit I was a little surprised with The Do-Deca-Pentathlon. The Duplass brothers can be pretty hit-and-miss, but they succeeded in crafting an enjoyable film that is both lighthearted and fun. I would have preferred a little more closure, and the aforementioned camera zooms can be bothersome, but I was generally pleased overall. Hopefully the brothers don’t forget about their humble beginnings and will take on more projects such as this. Pentathlon?? I’ve never even heard of such a thing. I’m not familiar w/ The Duplass brothers either, aside from reading a couple of reviews of Jeff Who Lives At Home, this one sounds interesting, but not something that I’ll hurry up to see though. Yeah, their name for the event doesn’t really make much sense. 😀 This is an enjoyable little movie, Ruth, and it would make for a good rental when it hits DVD (or VOD). Looking forward to this, and absolutely love the Duplass brothers. Hi Kid, thanks for stopping by. 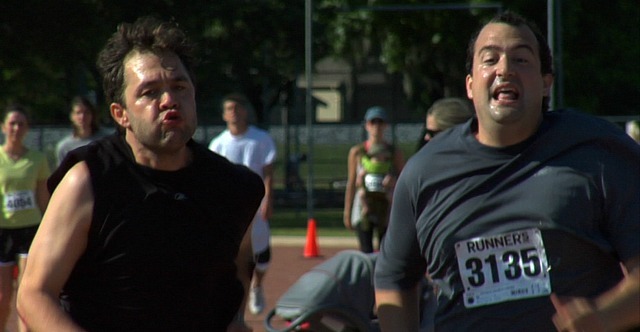 If you’re a fan of the Duplass brothers, you will definitely dig this. I think it may be my new favorite from them.